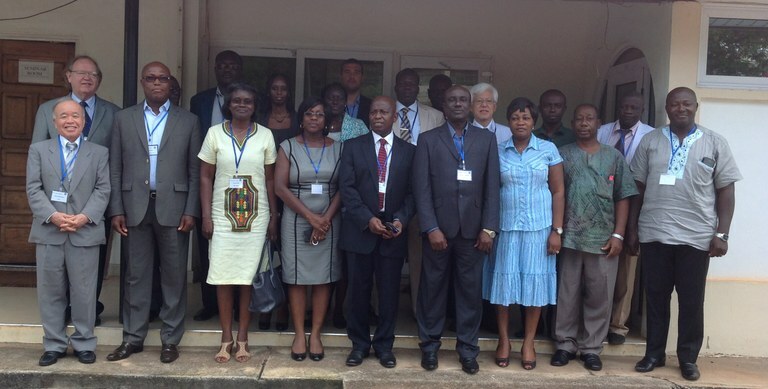 The TWAP Lakes Experts Consultation Meeting for West Africa was organized by the International Lake Environment Committee (ILEC), lead agency for the lakes and reservoirs component of the GEF Transboundary Waters Assessment Programme of the TWAP on the 16 and 17 June. The meeting objective was to introduce a questionnaire which will assist in collecting experts’ judgment and perceptions on transboundary lakes or lake basins in West Africa. The exercise will provide information for ground truthing of GIS and Remote Sensing information to enhance the effectiveness of the overall global assessment. The experts used the opportunity to make presentations on the status of various lakes and lagoons in the region including Ghana, Togo, Burkina Fasso and Benin. At the request of ILEC, WRI-CSIR organized a field trip for the ILEC officials and other participants on the 17 June. The team visited the Weija Lake, where the public water supply for the western part of Accra is located and the estuary of the Volta River at Azizanya near Ada Foah in the Dangme East District in the Greater Accra Region.